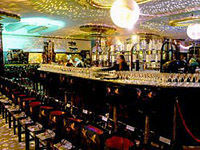 Located on Brewer Street, Soho in London's West End, Titanic is a spectacular 1920s former hotel restaurant that can cater for sit-down dinners for up to 400 & parties or receptions for up to 500 guests. The 480 square metre room originally designed by Oliver Bernard to resemble the interior of a luxury cruise liner has retained all its original features and epitomises spectacular art deco style. 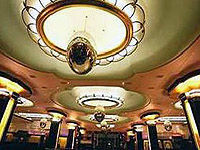 Recent refurbishment has added an extra dimension to the area with a terrazzo floor, sophisticated lighting, sumptuous leather banquets, gold leaf panelling and striking giant mirror balls suspended from the ornate ceiling that create a dramatic disco ambiance when used in conjunction with different lighting effects. It is suitable to hire for all occasions, such as corporate events, photo shoots, filming, exhibitions and receptions.